Is the weather slowing you down? Just as you can be bogged down by a bad storm, so can your garage door. Freezing temperatures can cause parts to lock together with ice and rain can cause corrosion and rust. What does all of this mean? A door that may not be ready to go when you need it most. Even if the signs aren't immediately evident, erosion will still happen over time with frequent use. Rather than waiting for the inevitable day when your door won't open or close all the way, and delays your busy schedule, let us come out and get to work. If the weather hasn't stopped you, it shouldn't stop your door either, and we can make sure it doesn't. 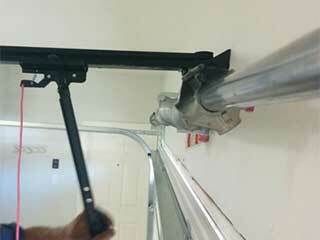 Don't spend extra money trying to take care of garage door maintenance on your own. If you aren't fully trained like our staff, you may be putting time and funds into replacing something that only needs a repair, or vice versa. You might even tend to the wrong part altogether if you're not sure what to look for. Rather than wasting a day off from work and your hard-earned cash, have our professional technicians handle things for you. We're happy to come out whenever is best for you, and will make certain that every spring and cable is in working order. If you've recently had a storm blow through, your garage door may appear unscathed at a glance but that doesn't mean it's safe. It's possible that the sensors that keep your pets and family members safe if they accidently walk under the door while it's closing were damaged or tweaked. This could cause an unnecessary risk to your loved ones if not tended to properly. We're prepared to give your door, and its safety system, a thorough testing to make absolutely certain that no one will be put in harm's way. Rather than just hope that everything is in perfect working order, put your mind at ease with the knowledge that our experts have. Rain or shine, we're ready! Call us now, and let us get started on keeping your garage door in excellent working order. It's better to be safe now, than sorry later.